Urban planners are increasingly embracing small-scale or temporary interventions that lead to larger positive change. These tactics could include outdoor exhibits, temporary mini-parks in parking spots, seasonal retail in vacant storefronts, small beautification projects, and street fairs. 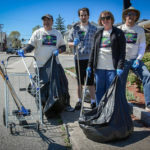 Several communities across Massachusetts have found that the strategies, known as “Do-It-Yourself Urbanism” or “Tactical Urbanism” can be accomplished by ordinary citizens but have many benefits. Lowellians, too, have used many of these creative approaches, but we could do even more! Brainstorm! : Anybody interested in Lowell can submit small-scale ideas: an evening cultural fair, a flowerbox, temporary streetart... the only limit is participants' imaginations and some simple guidelines. Participants may also use the online forum to comment upon the ideas. The DIY Lowell team will also go into the community to solicit ideas during this time. Choose! : The DIY Team combines and modified the ideas when appropriate, always reaching out to the original submitters. Then, anyone who pledges to help can vote on the ideas. The top ideas will be discussed at the Community Idea Summit and get extra technical help going forward. Meet! : Nonprofits, city officials, and citizens come together to discuss the winning projects and other ways to help the community in a public meeting: the Community Idea Summit. Trained facilitators lead a breakout group for each idea and help form working groups and develop action plans. Make it Happen! : After the summit, each idea's working group gets technical assistance from DIY Lowell organizers, leaders in the community, and each other. We help groups apply for additional funding, get the right licenses, and with other guidance. DIY Lowell is a completely citizen-led initiative. Two Lowell residents coordinate the group as volunteers, and an advisory committee provides direction and reviews ideas for compatibility with the guidelines. Advisory committee meetings are called as needed and we invite anybody interested to join. Aurora Erickson: Aurora is a community activist who currently works for Coalition for a Better Acre, coordinating the Merrimack Valley Time Exchange and civic engagement programs. She has experience in museum administration and is a board member of the Lowell Historical Society. She is also a member of the Lowell Votes steering committee. Chris Hayes: Chris is an urban planner who has focused on community engagement, land use, and transportation for the previous five years. He works at the City of Lowell on alternative transportation projects. He is on the steering committees of Lowell Votes and Planners Network, the organization of progressive planners. DIY Lowell's Street Team spends the months of May, June, and July getting out into the community and spreading the word about DIY Lowell! Please say hello to them if you see them at an event or on the street. They also are in charge of DIY Lowell's social media and tend to be outstanding folks in general. We will announce our 2019 Street Team in May. Go to our front page and fill out the form under "Submit your Idea!" If it's your first time submitting an idea, you'll fill in a form with your name and email so we can contact you if we have questions about your idea. Before you do that, however, make sure to check the idea guidelines and previously submitted ideas to make sure someone hasn't already submitted a similar idea. Why isn't my idea showing up after I submitted it? If it's your very first submission, you have to wait for a DIY Lowell team member to approve your idea. After that happens, any additional ideas you submit will appear instantly. Can I comment on ideas? Yes, just click on the idea to go to the idea's main page and you'll find a comment box. There, you can add additional suggestions, examples of when the idea was done in the past, or ideas on who to invite to the summit if the idea is chosen. All comments are anonymous—it's about the ideas, not the people! When you submit an idea for the first time, we create a DIY Lowell account for you. With an account, you don't have to fill in your contact information each time, ideas you submit will appear instantly, and you can comment on other people's ideas. If you want to create an account without submitting an idea, you can use the form in the upper-right hand corner of the page. Can I use Facebook to log in? Yes! Before you submit an idea, click the "Facebook" icon in the upper-right hand corner of the screen and it will create a DIY Lowell account linked to your Facebook account. After that, as long as you're logged into Facebook, you can click the Facebook icon to log into DIY Lowell as well. This works for Twitter and wordpress.com as well. I'm not sure if my idea is eligible. What should I do? If you aren't sure if your idea is eligible under the guidelines, send a message with our contact form. We'll get back to you ASAP to let you know if your idea is eligible or if you might modify the idea to make it eligible. Who will choose which ideas to discuss at the DIY Lowell summit? Anyone who registers for the DIY Lowell Summit will have a chance to vote on their top ideas. This way, the people who are committed to going to the summit to help make the ideas happen will have a chance to work on their favorite ideas. We'll let anyone who submitted or commented upon a winning idea know. Who will make these ideas happen? At the DIY Lowell Summit, facilitators will help each breakout group make an action plan for each winning idea. We'll ask passionate folks in each group to form a Working Group to make the action plan happen. The DIY Lowell team will keep in touch with those Working Groups, making sure they have everything they need to make the ideas a reality in 2015. How will the ideas be funded? The DIY Lowell team has identified several funding sources. We have established a relationship with the New England Grassroots Environment Fund, who can fund up to $1,000 for each project that falls within their sustainability-related guidelines, and we're in talks with other foundations. Finally, DIY Lowell will be able to provide a small amount of assistance as well. This seems like a lot of work for a few small projects. That's not a question, but it's a comment that we receive often. However, we're interested in goals beyond completing the projects. We're interested in finding the best way to turn talk into action by identifying the common barriers our working groups face. We're interested in bringing more voices into the community conversation and encouraging folks who might not have time for a huge commitment to take on a small piece of a small project. We want to empower those who live, work, or love Lowell to make a positive impact in our community. Finally, we're laying groundwork. If DIY Lowell 2015 is successful, we'll try to recreate and improve the process next year. DIY Community Chill 2018 was a Great Success! Click to see all ideas!